PRESS RELEASE: Soultone Cymbals is proud to introduce the addition of Old School Edition cymbals to their Vintage Series product line. The company will be presenting them at the 2010 Winter NAMM show (Booth 2979, Hall D). Developed in cooperation with Soultone Cymbals roster of top drummers, percussionists and their own Turkish master craftsman, this new line is based on the classic cymbals of the 1950's and 60's. They offer a richer, darker signature sound, and a new EarthStroke natural finish with deeper lathing to provide a sweeter open tone for nearly any style of music. In addition, the company worked with Jimmy Ford, owner of Ford Drum Company, to help identify and recognize some specific tonal properties and timbre for this special addition to an already successful series. 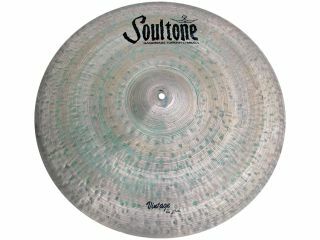 Soultone Cymbals developed their own multi-stage treatment bath to produce the unique finish and for the Old School Edition as well. "Our mission continues to be about creating the finest quality cymbals in the world, whatever it takes, and this very special new line sounds incredible - they really feel great to play, too," reports Iki Levy, founder and CEO of Soultone Cymbals. "Our artists give us lots of input and my wish was to incorporate their ideas throughout our products. They are a major part of the process for us and the reason we will not settle for anything less than perfection. Drummers and percussionists know what they want and they want the best of the best, so they come to us." Dealers and buyers will have special opportunities for purchase available during the 2010 Winter NAMM show at the Soultone Cymbals booth, 2979 in hall D.
Place pre-orders available now. Shipping as of January 14, 2009. Pricing: MSRP (based on model) ranges from $499 - $699 USD depending on size and type.